Finally, a somewhat sunny day! I've been waiting all week for a chance to take some good nail polish pics. Last Wednesday while I was out browsing Halloween costumes with a friend, we happened to stop by at Walgreens so that she could pick up a bottle of glow in the dark nail polish while I picked up a bottle of Creepy Pumpkin. I don't really own many orange polishes (approximately four bottles total, one of which is a creme and the others are shimmers) but I really liked the looks of this one, orange jelly base with orange shimmer and flecks. It's very thin, shown here with four very heavy coats. Wet'n'Wild also has another orange shimmer in the FastDry line called 9.0.2.1.Orange. The two are close in hue, but 9.0.2.1.Orange has gold flecks and shimmer. I love how much warmth this polish has. Super glowy. Oh, and super smelly too. 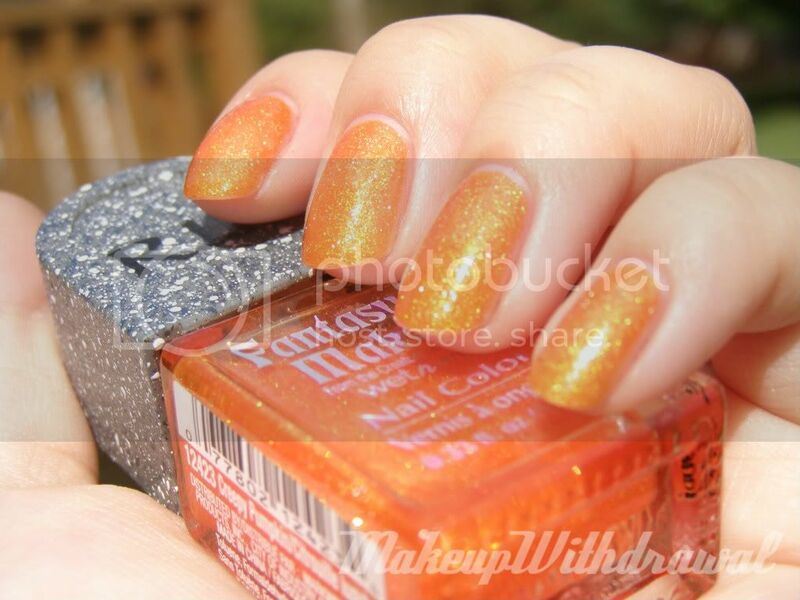 Did you buy any polishes from the Fantasy Makers line this year? I love my Black Magic version from last year, it's one of my favorites with the hairy rainbow glitter.